The terms “anklets’, “ankle chains’, “ankle bracelets’, “ankle strings’ or whatever else you may come across in fashion catalogues, jewelry stores and even in historical fragments, ring a bell sonorously enough, taking me back somewhere to my green days when the impetuous ’90s were giving a rise to spanking new crazy cultures, trends, and movements. I obviously have a hunch about them to be more than just a fashionable fad and that ambiguity is whetting my appetite to explore the meaning of anklets bracelet and how to use them. So let us jointly make an entertaining tour through the anklet zone. Jewelry stores now abound with anklets worked out of different materials and designed in different ways, the prices of which differ abruptly depending on the materials they are made out of. Acquiring an anklet is a piece of cake, in fact, but wearing it is no picnic, really. Here are some anklet types and rules of how to wear them for your mind-blowing look. • Golden Anklets: Needless to say that golden ankle bracelets are number one luxury indicators, especially when they are decorated with precious stones, like diamonds or rubies. Golden anklets commonly happen designed as a single thin chain or a two-layered one. It is advisable that golden anklets be worn by mature women rather than by ladies and of course at more special occasions. Hanging out with friends somewhere in a summer café or walking along the beach is in no way the right venue to sport your luxurious anklets, while a luxurious soiree will be just the case to show off your ankle bracelets paired with classic black pumps. • Silver Anklets: Silver anklets are more casual, with some touches of bohemian spirit to them and are exactly for young ladies. They might make an ideal harmonious pair with summer sandals, whether high-heeled or flat, and are perfect pieces to hotfoot it around the city in a breezy summer evening. • Barefoot Anklets: These are very popular items among Indian women. 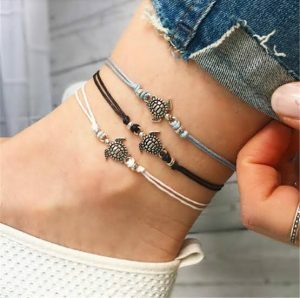 Barefoot anklets consist of a bracelet fastened on the ankle then stretching along the foot bridge and finishing with a toe ring, thus imitating a barefoot sandal only without a sole. They are ideal versions for those who are in a craze to walk along the beach barefoot. Oh, and those lacy anklets look so dazzling on a bride enjoying her own marriage on a beach! • Beaded Anklets: You may run into both monochromatic and iridescently beaded ankle chains that are the things for every bohemian girl or ethnic-style-estimator lady. Beaded chains can be matched with either sandals or beach-worthy flip-flops. Head to a beach now! • Anklets should be worn with a mini skirt or mini dress, with casual shorts, or leggings or else with cuffed jeans ” in a nutshell, with anything casual that bares the ankle zone of your foot. • To go with this daring anklet-style it is just a mandatory requirement to have perfectly groomed feet, without any calluses on them and with ideal pedicure, preferably in any vibrant shade. • Heading to work with a bracelet on your ankle may be considered as a serious violation of etiquette rules, especially if you work in a large financial company. Why not demonstrate your amazing golden anklet at that long-awaited corporate party marked with red on your calendar? • Some eccentric women prefer wearing anklets over their stockings or socks. However, try to eschew this option and wear anklets only on bare ankles for more effective results. • If your feet are thin and tender, opt for thin metallic anklets or even thin plastic ones but if they are not so thin and you are aspiring to make them visually slimmer and more slender, then anklets with some medium-sized trinkets hanging from them will fill the bill, for sure.